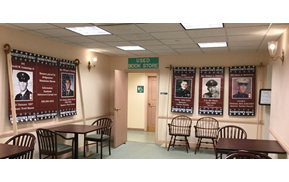 Approximately, 50 faces of veterans, ranging from World War II to current members of the military, are now adorning the walls of the lower level at the Bridgewater Public Library. The Bridgewater “Hometown Hero” banners feature veterans with Bridgewater ties who served or are currently serving in all branches of the armed forces. The project was started by a committee made up of members of the Bridgewater Historical Commission, veterans and Bridgewater residents. The banners, measuring 24 inches by 48 inches, each feature an image of the veteran, his or her name, the branch of service, the era of service if applicable and a sponsor’s name or message if desired.